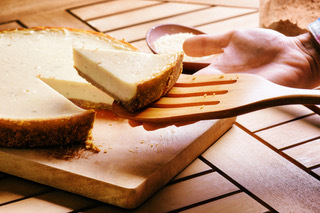 Mix America’s favorite dessert with a British speciality and get a delicious cheesecake with a lemon curd topping! In a large bowl, mix cream cheese, sugar, and vanilla until smooth. Add eggs one at a time. Mix to incorporate each egg in the cream cheese. Pour everything into the crust. Bake 40 minutes or until the cake is firm. 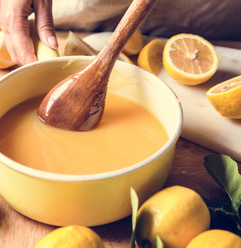 Put the butter, sugar and lemon juice into a bowl. Sit the bowl over a pan of simmering water and cook until the sugar is completely dissolved. Return to heat and cook, stirring constantly. Pour into small jars, cover and cool. 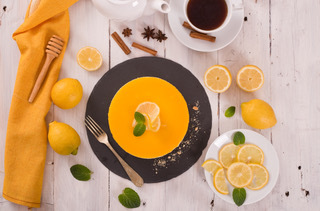 Once the cheesecake has spent at least three hours in the fridge, you can either eat it directly with a bit of lemon curd on the side or you can spread the preparation on top of the cake. If you do so, don’t forget to put the cheesecake back in the fridge for at least two hours!